A weathered blue rustic door is inviting you to come in. In this tapestry "Un Apres Midi" or 'one afternoon', based on the work of De Villeneuve, we see the billows of lovely pink flowers hanging from above to create a fragrant and gorgeous canopy. Feathery ferns line the walk for a soft look. The masterful use of light in De Villeneuve's work, as in the sun on the flowers, gives the scene a fresh breath of life. Look at the light on the scene and the shadows the flowers create in the door and walls. His sense of balance in composition as well as color, from the peach in the flowers to the orange in the walls is sublime. His hallmark qualities are a perfect complement to this beautiful subject of an afternoon in the French countryside. 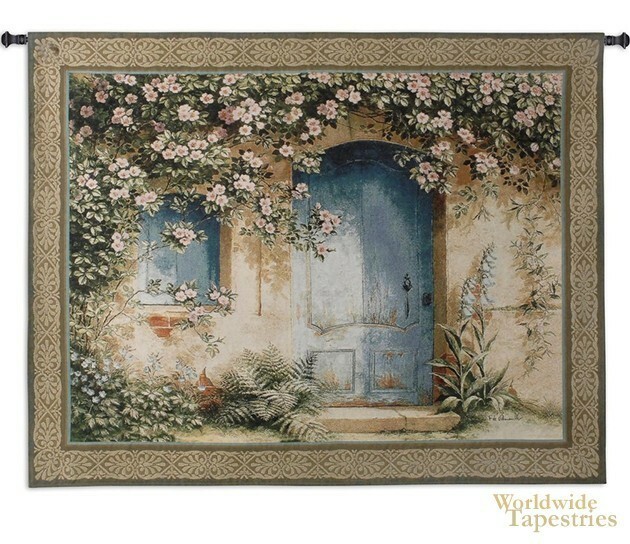 This tapestry "Un Apres Midi" is backed with lining and has a tunnel for easy hanging. Note: tapestry rod and tassels, where pictured, are purchased separately.